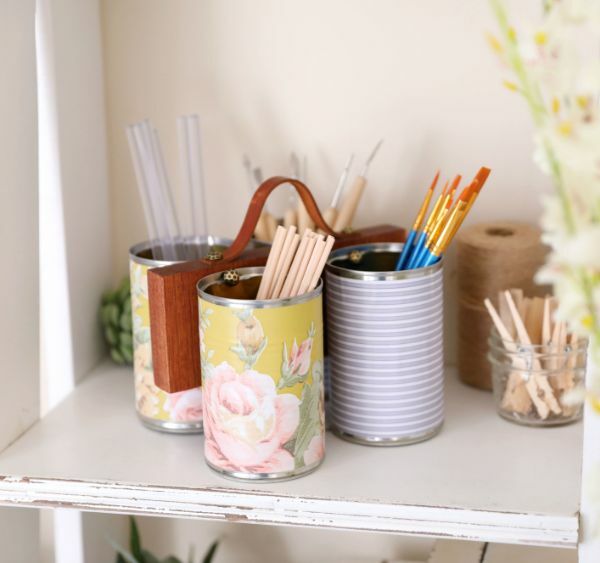 Cute and handy, this decorative craft caddy uses recycled tin cans to hold craft supplies. While this project is intended for adults, children can use the finished product to hold pens, pencils and markers. Simply place the caddy on a table or desk and grab the items needed from the cans. Many of the items required to make this craft caddy can likely be found in the home. For example, tin cans, contact paper, a long piece of wood and upholstery tacks are the main staples of this project. Use the following instructions to organize your supplies and show off a trendy craft project. 1. Lay wood flat on a work surface. 2. Use a ruler to measure 1 1/2 inches from the left side of the wood; mark the measurement with a pencil. 3. Use a ruler to measure 1 1/2 inches from the right side of the wood; mark the measurement with a pencil. 4. Flip the wood over on its opposite side. 5. Use a pencil to mark holes opposite of the original two holes made in steps 2 and 3. 6. Use a cordless drill to drill two holes on each side of the wood, making a total of 4 holes. 7. Place the wood in a horizontal position, with the long skinny side exposed closest to the holes drilled in step 6. 8. Measure 1 1/2 inches from each side of the wood and mark with a pencil. 9. Use the cordless drill to make a total of 2 holes on each marked spot. 10. Gather 4 vegetable cans. Remove any existing labels from cans. 11. Lay a can flat on contact paper, then use a pencil to mark the top and bottom rim to ensure a proper cut. The goal is to wrap the surface of the can in contact paper. 12. Use scissors to cut the decorative contact paper. 13. Remove the paper backing from the contact paper and adhere the sticky side to the can, wrapping the entire surface. 14. Repeat steps 11 through 13 for the additional 3 cans. 15. Use a hole punch to make a hole on the surface of each can, just below the top rim. Punch 1 hole in each can for a total of 4 holes. 16. Place the wood in a horizontal position so the 2 holes made in step 9 are accessible. 17. Place one end of a leather strap above a hole. 18. Use a hammer to tap an upholstery tack through the leather and into the tiny hole. 19. Place the opposite end of the leather strap above the remaining hole. 20. Use a hammer to tap an upholstery tack through the leather and into the second tiny hole. 21. Grab the new leather strap and flip the wood on its side. Line up the punched holes in 2 of the cans with the 2 holes on the surface of the wood. The cans should appear side-by-side. 22. 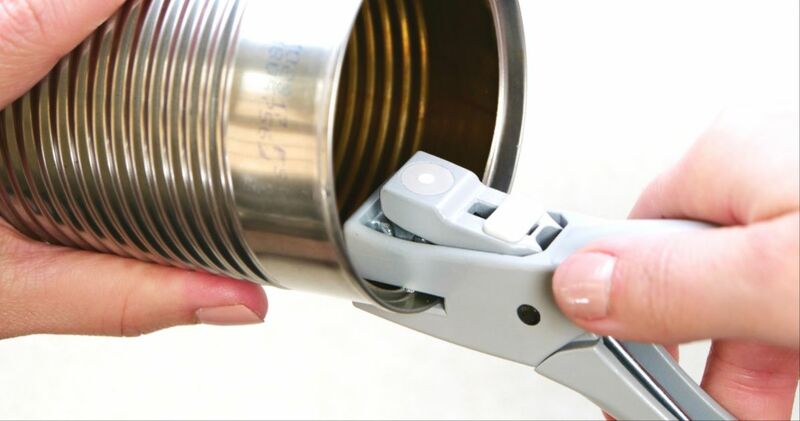 Place an upholstery tack inside the can, pointing the sharp end toward the wood. 23. Tap the tack with a hammer, securing it to the wood. 24. Use steps 20 through 22 to secure cans to the wood.